Will he live out the week? I love you. And I understand what it’s like when you’re just too exhausted to take visitors, or even to think about other people. When your mind recedes inside itself because there’s no energy to think, and your brain is overworked just running your body. 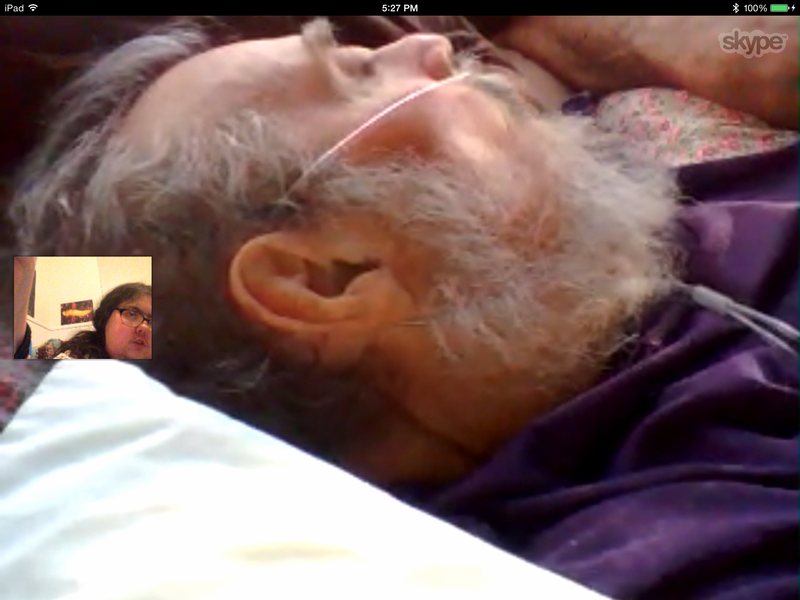 I Skyped you last night to say goodbye to you. I couldn’t say it out loud of course, but I did purr at you an awful lot. I know your brain can’t handle a lot so I’ll keep this short. You’ve been the best father I could ever hope to have. I wish you luck wherever you are going when you die, if you go anywhere at all. Remember I have put all my love for you into a place you can go whenever you need it, before or after you die. I love you more than I can say. Remember to surrender to love and you’ll be fine no matter what happens. And in case I never Skype with you again, goodbye. I could say more, but I’ve been saying it all with my eyes the last several times we’ve communicated. You know what I mean. I love you. Goodbye. That it’s good to see you again. Which day will really be the last? To know what goodbye meant?